(Honolulu, HI)— Oʻo Hawaii®is undoubtedly poised to make its mark in Hawaii; after all, the brand has already made a splash within the luxury beauty industry. Based in Haleiwa, Hawaii, Oʻo Hawaii®will make its local debut at one of the most prestigious Hawaiian luxury getaway destinations: The Kahala Spa at The Kahala Hotel & Resort. Oʻo Hawaii®is a new integrative luxury skincare line that features a range of crystal-infused, sustainably-sourced organic products. Integrative beauty is a fast-growing concept which focuses on beauty from the inside out. In other words, taking care of the outside from the inside through diet, exercise, and yes, skincare. With a focus on wellness and health,Oʻo Hawaii®founder Holly Harding offers a comprehensive skincare regimen that is ideal for a broad range of skin types, including sensitive skin. While consumers can be assured of Harding’s ultra-holistic approach to her new luxury skincare, many, many vital elements combine to create such a highly-effective collection. The brand also emphasizes the use of superfoods or ingredients that are rich in compounds such as antioxidants, fiber, or fatty acids. Harding has carefully selected superfoods from Hawaii such as red Alaea clay, Hawaiian red algae, Hawaiian sandalwood, Hawaiian coffeeberry extract, kukui nut oil, spirulina, strawberry guava, noni fruit extract, and macadamia nut oil. All elements are organically-grown and sustainably sourced from ethical farms around the world. In additional, Oʻo Hawaii®features probiotic-rich fermented ingredients such as sea silt, plant-based phytoplankton, fermented radish root, and lactobacillus. The ferment components work to boost the effectiveness of the essential active ingredients that include ferulic acid and sodium hyaluronate—or known anti-aging elements. With high-impact ingredients such as these, the collection’s results are irrefutable; after all, The Kahala Spa will prominently feature Oʻo Hawaii®as a holistic, Hawaii-based luxury skincare brand alongside clinical-grade world-renowned products. Spa guests will have the option to indulge in Oʻo Hawaii®products within the 60-minute Customized Facial Offering during which a Birds + Roses Facial Mask and Golden Nectar Serum will be applied. The 90-minute Customized Facial Offering will also include a Gua Sha facial massage featuring the Brilliant Feather Beauty Balm. The Gua Sha lymphatic facial massage will also be offered as an add-on treatment for guests seeking other therapies as well. All nine elements of the skincare line are encouraged to be used as part of a daily skincare ritual that begins with dietary supplements and ends with a Gua Sha lymphatic facial massage. Listed in order of recommended use, the full line collection is formulated for all skin types. Oʻo Hawaii®will be sold at The Kahala Spa but can also be found online at www.oohawaii.com. The brand can also be found at Blush Skin Bar (San Diego), Green Jungle Beauty Shop (Laval, Quebec), and Bio Signature (Macau, China). The brand will also be available in the United Kingdom via Feel Unique, an online retailer on par with Sephora. Named after the Hawaiʻi ʻōʻō bird (Moho Nobilis), the honeyeater was renowned for its vibrant yellow plumes which were carefully plucked and sustainably collected by ancient native Hawaiians. The brilliant feathers were then used for robes, capes, and feathered staffs adorned by the Hawaiian nobility. The eventually overhunted (by the introduction of lead guns) ʻōʻō bird lead to the species’ extinction, providing a valuable lesson that Oʻo Hawaii® Beautytakes to heart. The company sources its skincare ingredients in a way that seeks to preserve, protect and improve the skin through an integrative system of internal and external skincare. The brand also ensures that the natural resources of its ingredients are maintained and protected. 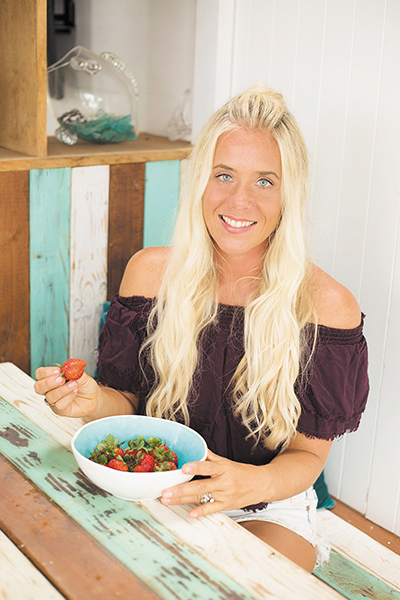 Holly Harding is certified as an Integrative Nutrition Health Coach (INHC) and American Association of Drugless Practitioners (AADP) and has studied over 100 dietary theories with the country’s top experts in holistic health and nutrition. With an establish mind/body transformation program called The H Lyfe Method®, Harding believes that beauty starts from within with a diet of nutrient-rich, unprocessed and unrefined foods. Oʻo Hawaii® was created as a way to accomplish beautiful skin through a combination of diet, supplementation, and highly functional skincare.